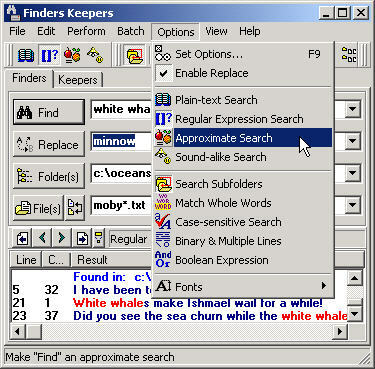 Search files of any kind, replace text, index files for instant searches, and launch files for viewing or editing. Search 4 ways: plain-text, regular expressions, approximate, and sound-alike. View, edit, or launch found files 6 ways, e.g., by associated files, built-in ASCII text editor, or binary viewer. Search zip files too. Change file dates or attributes. Replace text in multiple files. Zip found files. Control actions with 70 options. ...... Find additional information in the following: text retrieval, text search, file search. There are many options for advanced users, including regular expressions similar to grep, but non-technical users can operate the program easily. Qweas is providing links to Finders Keepers 4.10.1 as a courtesy, and makes no representations regarding Finders Keepers or any other applications or any information related thereto. Any questions, complaints or claims regarding this application Finders Keepers 4.10.1 must be directed to the appropriate software vendor. You may click the publisher link of Finders Keepers on the top of this page to get more details about the vendor.